"What do you get when you throw the following contents into a gaming recipe? 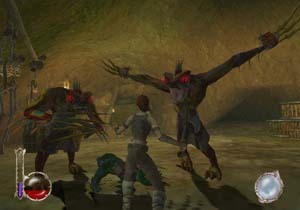 Originally designed on the PC, Drakan: The Ancients' Gates goes beyond the PC version in this all new exclusive 3D adventure for the PlayStation 2. The story starts with Rynn returning to her home village to discover that everyone has been slaughtered by a mysterious and evil force. 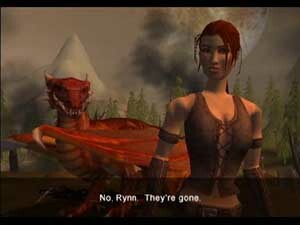 After burying the dead, Rynn seeks out the Queen of her homeland in order to discover some answers. When first playing Drakan, the first thing you will notice, apart from the beautiful graphics is the amazing draw distance. The 3D world of Drakan: The Ancients' Gates is massive and you can actually feel like you are in another world. The game boasts eight different playing environments and 15 levels of adventuring goodness. 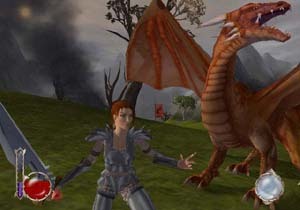 In essence, Drakan is a role playing game and you are awarded experience points for defeating your enemeies. Everyone time Rynn levels, you can are given points that you can distribute your various skills that are melee, archery and magic. There are also a variety of different weapons that you can find and buy in the game that range from longbows, swords, axes a variety of other items of destruction. However, with all weapons and armour in Drakan, they also take damage when you attack foes so you must return to the blacksmith every now for repairs. Alternatively you can find new weapons that are scattered through the lands. As Rynn, you can perform the following moves that include, attacking, climbing, defending, hanging, jumping, running, swimming, talking, walking and using magic, weapons and items. 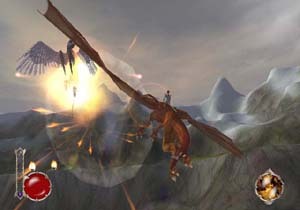 The game contains over 50 weapons and around 30 unique spells that are only available to Rynn herself. Combat in the game is done through two different systems that include melee and magic attacks. As Rynn, you can either use your deadly weapon as a hack and slash game or use her powerful magic to dispatch your foes. Whereas Aroch only has access to his dragon breath. Not only can Aroch attack airborne targets but he can also attack land based ones. A very cool feature! The graphics of Drakan: The Ancients' Gates is truly spectacular. The main feature of the graphics is amazing almost limitless draw distance that gives some huge playing environments. There are many different areas of play that include rivers, meadows, valleys, mountains, trees, grass, hidden caves and much much more. The game features some very nice lighting effects that go hand in hand with the games textures. All characters in the game look sharp, clear and highly detailed. The programmers have done an excellent job at making Aroch appear huge when he lands while small when you are soaring through the skies. The game also keeps a constant framerate the majority of the time but does occasionally stagger. We can forgiven this small little problem because of the beautiful graphics that the PlayStation 2 is pushing around. The soundtrack of Drakan has a very adventurous and medieval theme to it that helps set the atmosphere of the game, one of excitement and intrigue. The voice acting of the game is top class and features some funny one-liners between Rynn and Aroch that makes you wonder just what kind of relationship these two have. The sound effects cannot be faulted and features enough background ambience to make the world of Rynn and Aroch come true. 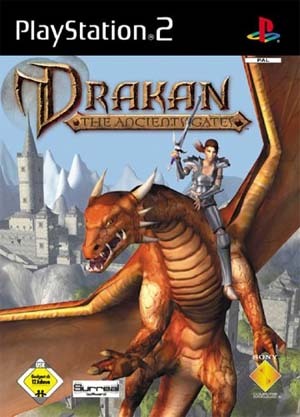 Drakan: The Ancients' Gates takes around 25 hours to complete and contains some of the largest gaming environments that have been seen on the PlayStation 2. Beautiful graphics, a wonderful storyline and great gameplay that is suited to all players and ages is a must have game for the collection. Fortunately, Drakan does have some replay value because there are various subquests and hidden areas that cannot be found in the first sitting of this game. Highly Recommended!